Rosetta’s lander Philae will eject from the spacecraft, touch down on the comet’s nucleus, and immediately fire a harpoon into the surface to anchor itself so it won’t drift off in the weak gravity. Europe’s Rosetta spacecraft is on its way to intercept comet 67P/Churyumov-Gerasimenko. Comets have been intercepted before, but this mission is different. Rosetta aims to make history by landing a probe on the comet’s surface while the mother ship orbits overhead. 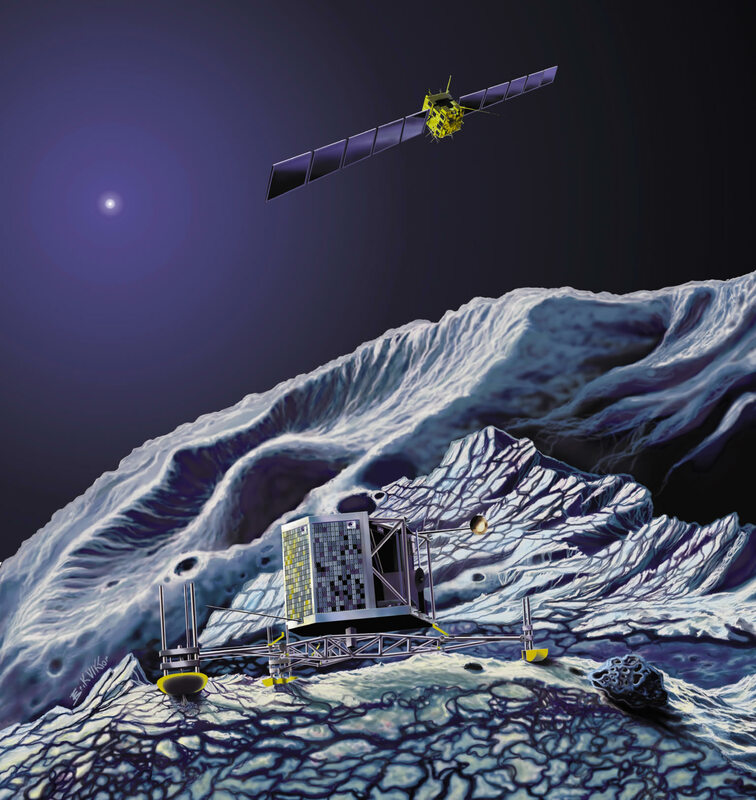 Rosetta’s payload contains 21 instruments (11 on the orbiter, 10 on the lander) designed to study almost every aspect of the comet’s chemistry, structure, and dynamics. Three of the sensors were contributed by the U.S.: Alice (an ultraviolet spectrometer), IES (an ion and electron sensor), and MIRO (a microwave sounder). The main event of the mission will likely be the landing. The 100-kg lander, which looks a bit like a cross between NASA’s old Viking Mars landers and a modern microsatellite, will spend two weeks fastened to the comet’s icy surface. The European-built probe will collect samples for analysis by onboard microscopes and take stunning panoramic images from ground level. Rosetta’s sensors will perform the experiments that reveal how the chemicals present interact with one another and with the solar wind. Alice and MIRO detect uncharged atoms and molecules, while IES detects the ions and electrons as the solar wind buffets the nucleus. One problem that often vexes astronomers when they try to study comets is visibility. It’s hard to see through the dusty veil of gas billowing away from the heated nucleus. The microwaves MIRO detects can penetrate the dust, so MIRO can see and measure its target molecules even when other instruments can’t. MIRO is one of several experiments focused on the comet’s structural properties. It will determine the comet’s dielectric constant, emissivity, and thermal conductivity to determine whether it is made of a powdery loose material, has a detectable layer of loose material, or is hard as rock. Rosetta enters orbit in 2014. Stay tuned for updates! Check out “Comet Quest,” the new, free iPhone/iPad game that has you operating the Rosetta spacecraft yourself. Get the link at http://spaceplace.nasa.gov/comet-quest.